A green tea poultice is effective for many skin problems, but most notably for blackheads and acne. Green tea also soothes burned or inflamed skin. Known for its antioxidant powers, green tea has been hailed as the fountain of youth for many skin problems. The antioxidant benefits from green tea may be obtained by drinking the tea, and many skin preparations use extracts from green tea mixed into lotions and bases to treat everything from blemishes to eczema. Green tea has been used for over 4,000 years as both a beverage and a medicinal herb. The majority of research on green tea's health properties focus on its antioxidant properties. Antioxidants neutralize free radicals, which can damage cells over time. 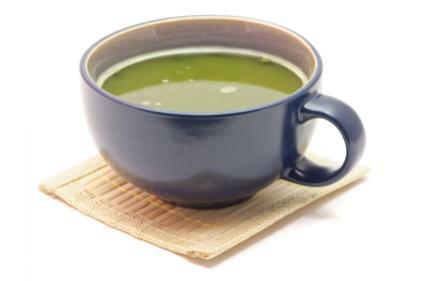 Green tea has also shown antimicrobial and anti-viral benefits. It's the combination of its antioxidant and antibacterial properties that make it an attractive ingredient for a poultice. Poultices are a time honored remedy for skin ailments. A poultice consists of either leaves or plants crushed, mixed with water and pressed to the skin or a cloth or cotton ball soaked in an herb and water mixture and pressed to the skin. Very warm water is used, and the action of the herbs along with the heat opens up any skin infection and allows it to drain. They're useful for many different types of infections, but especially for boils and non serious infections in the hair follicles. You can buy commercial tea poultice and creams from many natural health stores and pharmacies nationwide. Most of them consist of bentonite clay mixed with green tea extracts and other skin soothing herbs. Most beauty masks contain some type of clay, which hardens and gently draws out impurities such as blackheads. With warm water, the clay turns to liquid again and rinses off the face. There's a newer use for green tea; as burn treatment. Many cancer patients undergo radiation therapy to treat cancerous cells. And while doctors target the cancerous growths as narrowly as possible with the radiation beam, it's not always possible to avoid burning healthy skin. Many patients feel discomfort in the areas undergoing radiation therapy due to skin burns. To ease the pain, try a green tea poultice. According to information published at Pub Med, green tea may help radiation burns heal quicker when it's applied directly to the burns. To make your own tea poultice, all you'll need is some warm water, green tea (loose leaf works best), a bowl, plastic wrap and a clean cloth. Simply boil the water and add the green tea leaves. You should add enough green tea so that the mixture resembles a thick mixture like oatmeal. Boil the water and allow the tea to sit for at least five minutes. Very carefully, when the leaves are cool enough to touch, strain out the tea leaves and press the wet, soppy tea leaf mixture to the affected skin. You can wrap the area with plastic wrap or press the clean cloth against the area to hold the leaves in place. Repeat as necessary. If burning or irritation occurs, discontinue use. Another method is to strain off the tea leaves and soak cotton pads or cotton balls in the tea mixture. For this method to be most effective, you should allow the tea to steep for twice as long as you would if you wished to drink the tea, about 10 minutes. Then use the green tea-soaked cotton as the poultice. Green tea is one of those herbal preparations that makes you wonder at the diversity and bounty of healing preparations available in nature. There are many more healing uses of green tea. Benefits of drinking green tea. Caffeine content in green tea is slightly less than other teas. Green tea healing properties and uses. Green tea herbal product information, myths and facts. Other types of green tea.